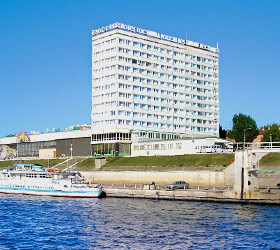 The modern "Rossia Hotel" stands on the bank of Volga in the Samara city centre overlooking the magnificent riverside, right beside the river passenger terminal, and is able to accommodate up to 200 guests in rooms of various categories. The rooms include: free of charge Wi Fi Internet access, direct telephone connection, multi-channel cable television system, refrigerator, electric kettle, bathrobe, shower set, hair-dryer. The hotel cafe is located on the 2nd floor, serving main courses, appetizers and drinks. Another dining facility on-site is the hotel bar, which welcomes guests 24 hours. Front desk provides local and international telephone calls, safety deposit boxes for valuable belongings, taxi call at any desired time. Driving guests can make use of the parking lot, situated right in front of the hotel. Three hotel conference halls (with maximum 100 persons capacity) provide an abundance of opportunities for holding business meetings, conferences and seminars. The halls come equipped with playback and multimedia equipment, flipchart, top table, air conditioning, telephone. The hotel business centre offers PC use, office appliances, Wi-Fi Internet.